Welcome to the New Release post and Blog Hop showcasing projects from Our Daily Bread Designs March Release! You can see all of the March Releases here. Continue reading below to find out how you can win one of three $25 Gift Certificates to the ODBD Store good towards the purchase of ODBD stamps. 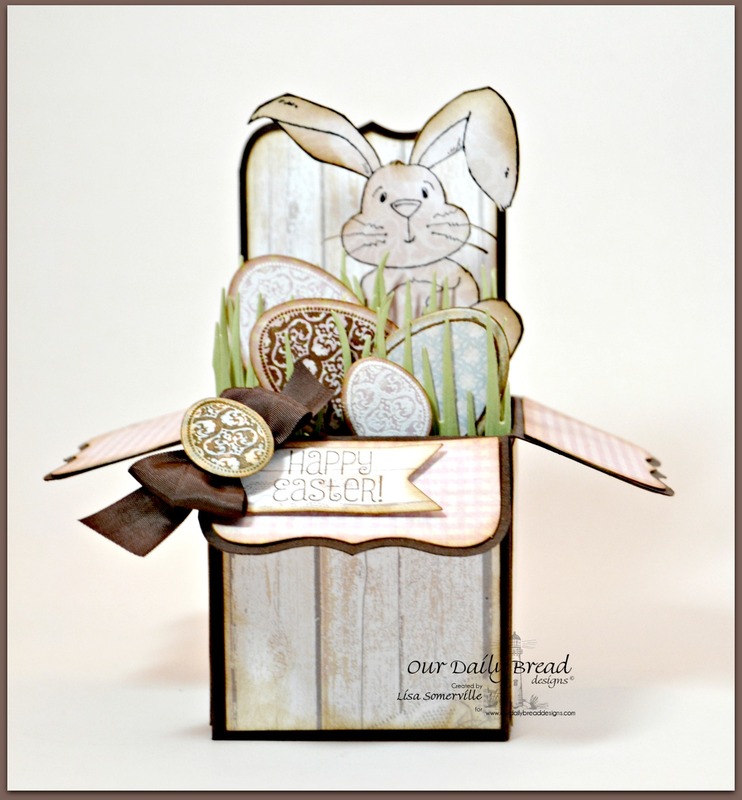 Today I'm sharing two projects created with the new Blessed Easter, Basket of Blessings, Eggs Dies, Grass Border Die and Shabby Rose Paper Collection. My projects also feature some previously released dies and a cute bunny from the North Coast Creations Hippity Hoppity stamp set. All panels have been decorated with pattern papers from the beautiful Shabby Rose Paper Collection. I stamped and also embossed some of the eggs from the Blessed Easter and Basket of Blessings stamp sets on scraps of the Shabby Rose Paper Collection, then die cut and embossed them using the Eggs Dies, sponging the edges with Ranger Gathered Twigs Distress Ink. I die cut and embossed the Grass Border Die from Celery card stock, added the bunny from the NCC Hippity Hoppy set and stamped the sentiment on scraps of pattern paper and die cut using the Pennant Dies. I stamped the basket from the Basket of Blessings stamp set twice on to Kraft card stock and cut out the basket. To add shading, I sponged Ranger Gathered Twigs Distress Ink around and onto the basket. I stamped, embossed and die cut the eggs the same way I did them for the Box Card, and added the die cut grass. I created a small box to sandwich between the two stamped and decorated baskets to hold a small cello bag of treats. To embellish I stamped a sentiment onto scraps of the pattern paper, die cut the panel using the tag from the Recipe Card and Tags die set, and tied on a Vintage Brown bow. Three randomly selected winners will each receive a $25 gift certificate to Our Daily Bread Designs, good towards the purchase of ODBD stamps found in the "stamps column" of the ODBD Website, just for commenting on the Design Team cards! You have until Monday, March 2, 2015 at 9:00 p.m. EST to leave your comments. The Winners will be posted March 3rd, on Our Daily Bread Designs Blog, so be sure to check back there to see if you won! LOVE the box card with the adorable NCC bunny! Love the colors and papers you chose. The treat basket is super cute....you are the Queen of the "anything but a card" category!! HUGS!! That pop-up box card is just adorable! 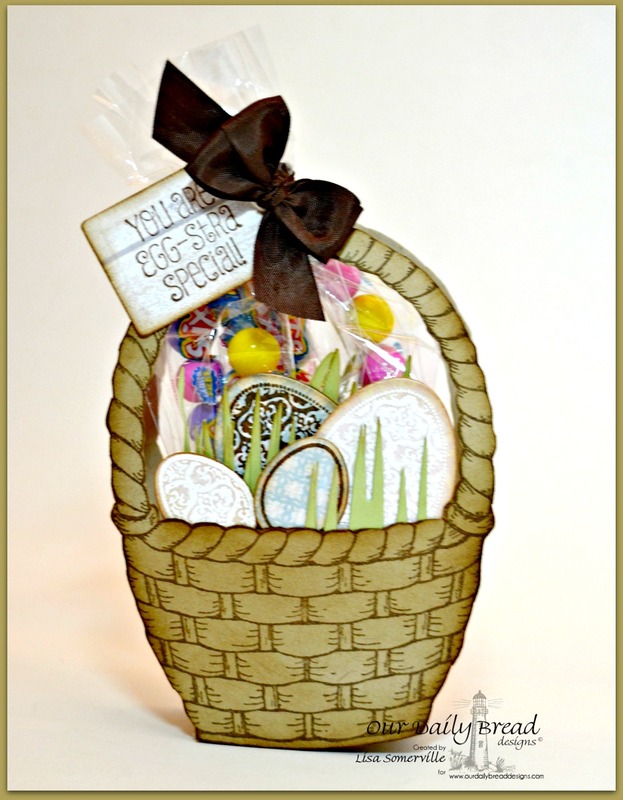 Those gorgeous papers are so perfect for it - what a sweet Easter treat. Oh.how.cute!!! Adorable pop up box! LOL, I agree with Ang... you're the queen of 'anything but a card'! Great samples!! Lisa - your popup box card is SOOOOOOOOO adorable!! And that NCC bunny is just the cutest bunny ever! Your second project is equally creative - so clever that you turned the basket into a shaped card!!! Love that! Your designs always inspire me - thank you for sharing these wonderful samples. Absolutely gorgeous. Love the pop up box card, but the basket is right up there also! I love these! The box card is one of the cutest box cards I have ever seen. Adorable and I love creative packaging so you can imagine how much I enjoyed the basket treat box. Well done. So adorable! I'm going to have to try my hand at one of those box cards. Thanks for inspiring me. Oh, that box with the rabbit is just too cute. I will have to try that. I did one at Christmas time. Didn't think of it for Easter but that is perfect. Love the shaped card too. Always looking for something different to do. How unique...the box card is wonderful and the treat basket is over the top! Wonderful 3-D projects. Your box card is adorable with the little bunny in the background. So enjoyed seeing your dimensional projects! Such cute projects! Love them! These are both so cute and so unique!! Great way to think outside the box (or in the case of the first project: on the box!). Both of your cards are so amazing in their own way. This is one of the cutest box cards I've seen. I really like the 3-D cards, so the basket is equally wonderful. Thanks for sharing. What a beautiful and creative designs Lisa! I just love your explosion box with the eggs and the sweet bunny!! The wood background dp is perfect!! Such a sweet basket shaped card to!! Beautiful samples!!!!! Gorgeous projects Lisa! Love the explosion box! The 3-D basket is just perfect and looks yummy! Great way to give a little gift! Such pretty cards! I especially like your fun box. Wouldn't that be fun with some surprise chocolates!?! What a fun bunny box and lovely Easter basket. Both of your projects are such clever and creative ideas! LOVE that bunny paired with the eggs in the box! The treat basket is beautiful! Both the projects are awesome! Beautiful papers! Both projects are so cute. I really like the box card, but my favorite is the adorable basket full of beautiful eggs! I love love the Bunny pop up card and the paper is perfect. The basket full of eggs is also very beautiful. Beautiful cards,your basket look real. Wonderful projects! I think your box card is the best one I've ever seen--love it! Both designs are fabulous. Love the basket and the card in a box is such a fun card. gorgeous cards!! love them both!! What great projects, Lisa! Love your box of eggs w/ the NCC bunny on top. Your big basket is just wonderful! Love how you worked the bunny into the scene! SO fun! Oh, Lisa…I love your pop up box…what a perfect fold for these beautiful eggs! Your basket shaped card is creative as well! Fabulous release projects! Hugs!